At the basic science level , Dr. Marmur and his colleagues were the first to demonstrate the possibility of a gene therapy approach based on ribozyme technology to inhibit the induced expression of the tissue factor (TF) gene. 2D model of the hairpin ribozyme used to cleave the TF substrate RNA (gray area). The ribozyme contains 4 helices and 4 loops. A fifth loop is formed within the substrate RNA on binding to the ribozyme, where cleavage occurs (*). The idea that TF could be an appropriate target for gene therapy derives from Dr. Marmur's demonstration that the tissue factor gene is induced by balloon angioplasty ( JCI 1993 ). Analysis of TF mRNA in rat aorta and cultured vascular smooth muscle. (A) RNA blot hybridization: aortic media. Lanes contain 10 mcg of total RNA from the media of normal rat aorta (time 0) or from the media of aortas harvested at various time points (h) after injury. (B) RNA blot hybridization:cultured vascular smooth muscle. Lanes contain 10mcg of total RNA from quiescent cultured rat aortic vascular smooth muscle cells (incubated in DME with 0.4% CS for 48hr; time 0) that were treated for the times indicated with 10% CS. Blots were hybridized to the full-length rat TF cDNA and washed at 0.1 x SSC, 65°C. The hybridizing band corresponds to an 2-kb TF species. Ethidium bromide staining of the 18S and 28S demonstrates that lanes were equally loaded. (C) Autoradiography of sections derived from uninjured (time 0) and balloon-injured (2 hr) rat aorta hybridized in situ to an antisense TF 35S-labeled RNA probe. Hybridization of injured rat aorta (2 hr) with a sense TF 35S-labeled RNA probe served as a negative control. In situ hybridization of rat aorta . The luminal surface is found at the top of each photograph. Photographs are counterstained with hematoxylin. (A) Normal, uninjured rat aorta hybridized with a "S-labeled TF antisense RNA probe. (B) Rat aorta 2 h after injury hybridized with the same probe. (C) Rat aorta 2 h after injury hybridized with an "S-labeled TF sense RNA probe. (n=3 sets of animals; 18 sections per time point). 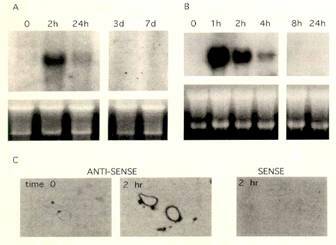 Blots were hybridized to the full-length rat TF cDNA and washed at 0.1 x SSC, 65°C. The hybridizing band corresponds to an 2-kb TF species. Ethidium bromide staining of the 18S and 28S demonstrates that lanes were equally loaded. (C) Autoradiography of sections derived from uninjured (time 0) and balloon-injured (2 hr) rat aorta hybridized in situ to an antisense TF 35S-labeled RNA probe. Hybridization of injured rat aorta (2 hr) with a sense TF 35S-labeled RNA probe served as a negative control. The luminal surface is found at the top of each photograph. Photographs are counterstained with hematoxylin. (A) Normal, uninjured rat aorta hybridized with a "S-labeled TF antisense RNA probe. (B) Rat aorta 2 h after injury hybridized with the same probe. (C) Rat aorta 2 h after injury hybridized with an "S-labeled TF sense RNA probe. (n=3 sets of animals; 18 sections per time point). Anti-TF hairpin ribozyme helix 1 optimization. Substrates corresponding to varying helix-1 length were prepared by T7 transcription and then incubated with the 63-nt anti-TF ribozyme containing a full-length (10-nt) helix 1 domain. Substrates (10-, 9-, 8-, 6-, 5-, 4-, 3-, 2-, 1-, and 0-nt helix 1) are shown in lanes 13 through 3, respectively. Reactions were performed with 25 nmol/L ribozyme and 100 nmol/L substrate concentrations. Efficient cleavage occurs with a 6-bp helix 1, but not with shorter helices. After construction of the ribozyme and determination of its optimal length and kinetic parameters, a ribozyme expression vector that used the retroviral vector pMV12 was constructed. The ability of this expression vector to generate anti-TF ribozyme was further augmented by positioning of the anti-TF ribozyme downstream of a rat tRNA val (RNA polymerase II) promoter. The resultant construct containing the anti-TF ribozyme was then used to transfect vascular smooth muscle cells and generate a variety of clonal cell lines. Northern blot analyses performed on 3 transfected and 3 untransfected clones demonstrated markedly reduced TF mRNA levels in the transfected clones both during quiescence and after serum stimulation. Northern blot analyses of control cells and cells transfected with the anti-TF ribozyme using a TF cDNA insert . Both during quiescence and after serum stimulation, the 3 clones (A, B, and C) transfected with the retroviral pMV12-Rbz demonstrated markedly reduced TF mRNA levels. Cell lysates analyzed for total TF activity by monitoring factor Xa generation similarly demonstrated a statistically significant and concordant reduction in TF activity in smooth muscle cells transfected with the ribozyme expression vector compared with both untransfected clones and clones transfected with the empty vector. Conclusions —These results demonstrate the feasibility of an antithrombotic strategy based on ribozyme technology. The AGENT trial was based on the observation that the angiogenic response to myocardial ischemia could be augmented in animal models by gene transfer with the use of a replication defective adenovirus (Ad) containing a human fibroblast growth factor (FGF) gene. The objectives of the Angiogenic GENe Therapy (AGENT) trial were to evaluate the safety and anti-ischemic effects of 5 ascending doses of Ad5-FGF4 in patients with angina and to select potentially safe and effective doses for subsequent study. Results : Seventy-nine patients with chronic stable angina Canadian Cardiovascular Society class 2 or 3 underwent double-blind randomization (1:3) to placebo (n=19) or Ad5-FGF4 (n=60). Safety evaluations were performed at each visit and exercise treadmill testing (ETT) at baseline and at 4 and 12 weeks. Single intracoronary administration of Ad5-FGF4 seemed to be safe and well tolerated with no immediate adverse events. Fever of <1-day duration occurred in 3 patients in the highest-dose group. Transient, asymptomatic elevations in liver enzymes occurred in 2 patients in lower-dose groups. Serious adverse events during follow-up (mean, 311 days) were not different between placebo and Ad5-FGF4. Overall, patients who received Ad5-FGF4 tended to have greater improvements in exercise time at 4 weeks (1.3 versus 0.7 minutes, P =NS, n=79). A protocol-specified, subgroup analysis showed the greatest improvement in patients with baseline ETT <=10 minutes (1.6 versus 0.6 minutes, P =0.01, n=50). Mean±SEM of change in total ETT time for all active and placebo patients at 4 weeks and 12 weeks after intracoronary infusion of Ad5-FGF4 or placebo. Conclusions— Results show evidence of favorable anti-ischemic effects with Ad5-FGF4 compared with placebo, and it appears to be safe. Angiogenic gene transfer with Ad5-FGF4 shows promise as a new therapeutic approach to the treatment of angina pectoris. Dr. Marmur recognizes that future advances are most likely to be derived from the field of genomics and the related subfields of functional genomics, proteomics, and bioinformatics. His efforts are specifically focused on the generation of the Downstate Cath Lab Database , a repository of molecular genetic, angiographic and historical information on at least 2000 patients who have undergone cardiac catheterization. This project will be performed in collaboration with the Cleveland Clinic Foundation.